New approaches to the treatment of tinnitus - a buzzing or ringing in the ears - are being pioneered and may hold the promise of a future cure. Over a third of the UK population will suffer from tinnitus at some point in their lives. For 600,000 of these people the condition will become so severe that it seriously impedes the quality of their lives. Sufferers can become agitated and forgetful. They are sometimes unable to sleep, sustain relationships, or hold down employment. Every year there are many reports of tinnitus driving sufferers to suicide. There is no respite from the constant noise and no cure. 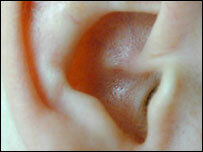 Tinnitus is often described as a 'mild ringing' in the ears. "After a long day you have got this incredible noise inside you. A whistling, squeaking, almost physical sensation in your ears. That is when you feel really really lonely. And because it is a silent symptom to everyone around you, there is this hopeless feeling of being on my own with it," says Kate. Like many tinnitus sufferers, she feels frustrated by the lack of help on offer. "There is a complete vacuum of information for people like me. Because it is not fatal people think it is not that bad. But it ruins lives." The message from most GPs is that there is no cure. But this is not the whole story. Berthold Langguth, a neurologist in Germany, believes the hearing cells in the auditory cortex (the brain area perceiving sound signals) in tinnitus sufferers are overactive and is trying to normalise them. By running an electric current through sections of wire he creates a magnetic field. When held over the head of a patient the magnetic stimulation reduces the neural activity and diminishes unwanted sound. I woke up and didn't hear a thing. Absolutely no sound at all. At first I thought I had gone deaf! Only one patient so far has been completely cured but many have found the volume of their tinnitus reduced. In Belgium, neurosurgeon Dirk De Ridder, has tried implanting electrodes directly into the brain of sufferers to permanently normalise the overactive neurons. So far he has only operated on 30 patients but with some successful results. Vivian, who had a permanent 80Db ringing in her head and felt suicidal was the first tinnitus sufferer to have the operation. "The first night I fell asleep. I woke up and didn't hear a thing. Absolutely no sound at all. At first I thought I had gone deaf! Now, there is no noise at all". Researchers in Cambridge have discovered that lidocaine, the most commonly used anaesthetic in the world, turns down the sound in two thirds of sufferers for roughly five minutes. Whilst the drug is dangerous and the effect transitory, the discovery is clear proof for the first time that there is a mechanism to turn tinnitus off. The golden key is to find a drug that has the suppressive effect of lidocaine without the side effects. "My hope, which is cautiously optimistic, is that we will see a drug available to sufferers within a 20 year period," says David Baguley, Consultant Audiologist at Addenbrooke's Hospital in Cambridge. Longing For Silence can be heard on BBC Radio 4 at 21.00 on Wednesday 9 January 2008.